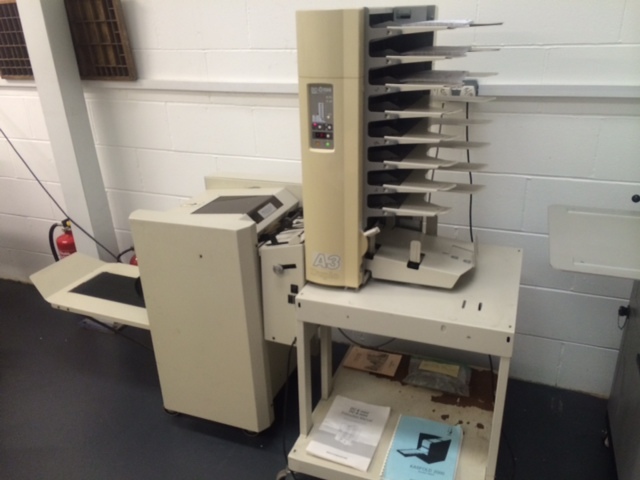 We now have a booklet making system made up of a Kasfold 2000 booklet maker and Duplo DC-8 Mini collator. 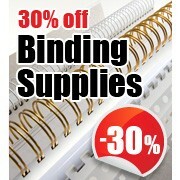 The Kasfold 200 booklet has a staple capcity of 210, will do up to A3 format and 2 staple heads. Time delay on sheet entry to staple time can be adjusted to suit. shingle delivery. Easy side guides and back stop adjustments for quick change over of formats. 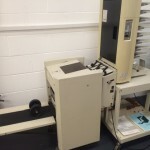 The Duplo DC-8 Mini collator is friction feed, 8 stations and has jam, miss and double detector warning lights. 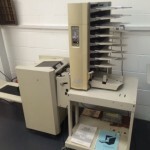 We now have a booklet making system made up of a Kasfold Booklet Maker and Duplo DC-8 Collator. The Kasfold 200 booklet has a staple capcity of 210, will do up to A3 format and 2 staple heads. Time delay on sheet entry to staple time can be adjusted to suit. shingle delivery. Easy side guides and back stop adjustments for quick change over of formats.